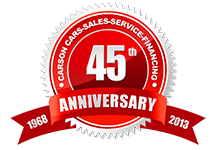 Carson Cars Auto Repair has been repairing radiators for over 45 years. It’s very important to maintain your vehicles cooling system. We offer full service radiator repair & installation for all cars and light truck radiators. Coolant leaks can happen anywhere within the cooling system, if you notice any dripping or bubbling your vehicle needs an inspection by a certified technician to make sure to stop the leak in it’s tracks and make sure no other damage has occurred. As a customer of Carson Cars Auto Service, your safety comes first, call us today to schedule your radiator service appointment!